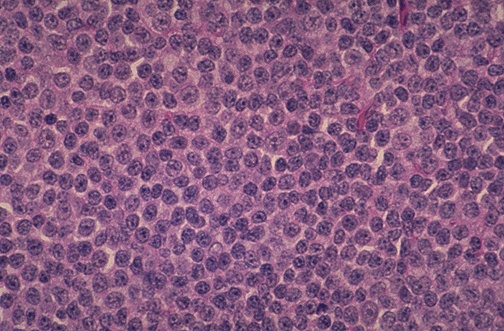 Many non-Hodgkin's lymphomas seen in adults are large cell lymphomas such as the one here at medium power, but they can be associated with immunosuppressed states (such as AIDS), and are typically of B cell origin. The cells are large, with prominent nucleoli and abundant cytoplasm. This disease tends to be localized (low stage), but with more rapid enlargement, and a greater propensity to be extranodal than the low grade lymphomas.